The Western Wall is part of the foundation of the huge platform that Jews call the Temple Mount. The bottom courses of stone above ground are from King Herod’s construction. The Dome of the Rock (upper left) is at the likely location of the ancient temple. Jews pray in the courtyard below at right, near the wall. 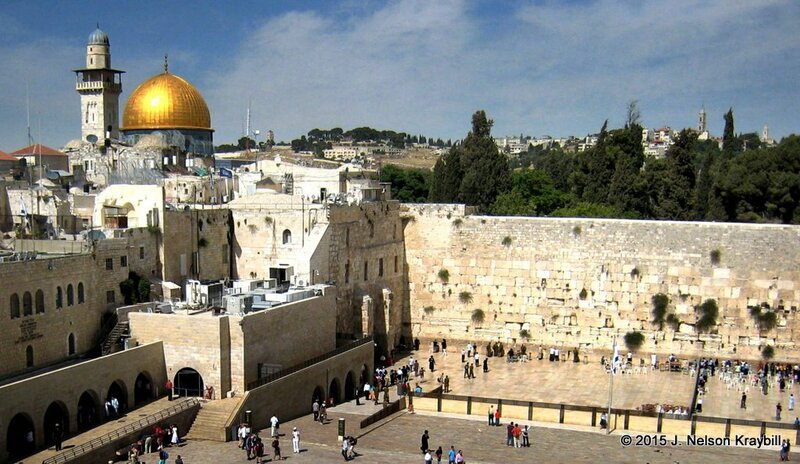 What spot on earth elicits more spiritual yearning than the great platform in Jerusalem that Muslims call the Noble Sanctuary and Jews call the Temple Mount? On this “holy mountain” King Solomon built the first temple, a structure Babylonians destroyed four centuries later. Here Zerubbabel built the second temple–demolished by Roman armies a generation after Jesus’ ministry. On this platform Jesus upset both money-changing tables and religious authorities. Here Muslim ruler Abd al-Malik built the Dome of the Rock shrine in the seventh century—an elegant structure that still is a jewel in the heart of the Old City. Under the dome is an outcrop of bedrock that, according to Jewish and Islamic traditions, is where Abraham prepared to sacrifice Isaac. From this rock, say Muslims, Mohammed and his horse took flight for a nighttime visit to heaven. Sacred to Jews, Christians, and Muslims, this religious precinct long has been a flashpoint of conflict. Devout Jews do not go up on the great platform for two reasons: 1) the presence of Jews is offensive to Muslims who control the precinct, and 2) there is danger of unwittingly walking into the Holy of Holies; no one knows precisely where the ancient temple stood. A worshiper weeps against the great retaining wall, all that remains of the temple destroyed in AD 70. So Jews pray outside and below the great platform, at a courtyard where a 200-foot length of the retaining wall built by King Herod is accessible. Colossal, finely-dressed masonry stones, some weighing an incredible 500 tons, form the wall. This facade is about as close as worshippers can get to the site of the ancient temple without going up onto the platform. The closest spot is an ancient underground hall next to Dome of the Rock along the Western Wall. Here Orthodox Jewish men pray, some before banners depicting the ancient temple. 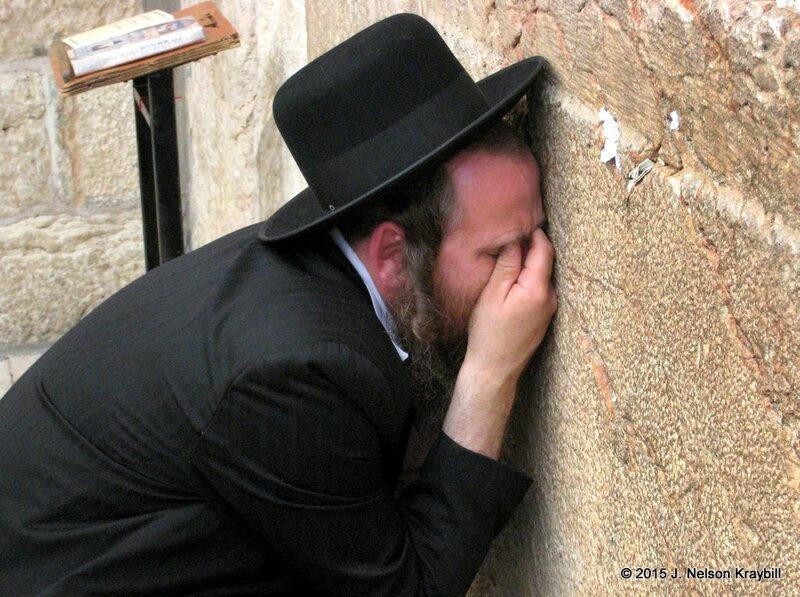 Others lean against the Western Wall and weep for loss of the temple. Elsewhere in the Holy Land, Palestinians weep for loss of homeland and civil rights since the founding of Israel as a state in 1948. Jews lament destruction of the temple and unfathomable losses of the Holocaust. Palestinians grieve what they call the Nachba (“disaster”) of 1948, when Israeli armies destroyed hundreds of Arab villages and displaced hundreds of thousands of Palestinians. Many of those Palestinians and their descendants still live in refugee camps today. At the Western Wall I thank God that Jews at last have a homeland. I love the scriptures they cherish and pray daily with Psalms they use. I also pray for Palestinians, who deserve security and dignity in the land of their birth. The provocation of Jewish settlers moving into West Bank territory that belongs to Palestinians grieves me and makes Israel less secure. I pray that Jews will follow the best lights of their own biblical prophets and seek justice for all in the Holy Land. I support Jews, Palestinians, Christians, Muslims and others who work for reconciliation among peoples of the Holy Land. I want Christians around the world to be agents of healing rather than add to polarization through uncritical Zionism or coercive boycotts. God hasten the day when the wolf and the lamb feed together in Jerusalem. This entry was posted in Uncategorized and tagged Dome of the Rock, Jerusalem, Jewish Temple, Nachba, reconciliation, Western Wall by nelsonkraybill. Bookmark the permalink. Thank you for this post. I agree very much with what you write about the conflicts going on there now. I guess in the end, the only answer is the arrival of God’s Kingdom – the Second Coming.